At Delphi, Apollo, the Lord of Light and patron of the Muses, urged pilgrims to "know themselves" and to "follow the path of moderation in all things." 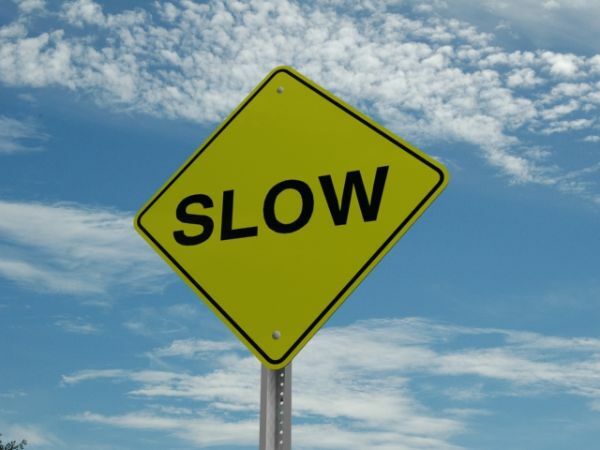 Slow is often a good thing, a useful antidote to an overheated world. Slow food, slow exercise, slow travel. You know the drill. You take the time to savour things, to enjoy the experience, the journey is its own reward...all that good stuff. In film sometimes the slow burn works. Barry Lyndon has often been called slow but I find it engrossing. Same thing with 2001: A Space Odyssey. It can work in TV too, especially in this age of quick cuts and jumped up phony storylines that get solved in 40 minutes. But then there's the wrong kind of slow where the director or the show runner thinks that he's such a fascinating fellow that he can do anything he likes and we'll watch engrossed...This is what happened to Sophia Coppolla in her film Somewhere and it's whats been happening to Breaking Bad. Seven Episodes in we've covered the territory that they might have covered in perhaps two and a half episodes in another year. Brian Cranston has said on the Breaking Bad podcast that this policy is deliberate and that they are trying to "teach the American viewer an entirely new vocabulary and method for watching television." Quite. Has social engineering been tried on American TV before? I can't imagine that this is a good idea. Breaking Bad's deliberate slowing down of the pacing has exposed a lot of the show's problems that I never noticed before. Here are some of them: 1) The plots can be shaky. Last Sunday's "we're selling drugs to get your attention" storyline was maybe the dumbest thing I've seen in four seasons. 2) Aaron Paul is a little too pretty and a tad too white collar for his role of Jessie. 3) Bryan Cranston is brilliant, as is the guy who plays Hank, but the rest of the cast (I'll name no names) are not the greatest actors working in the medium. 4) Mike's skills are increasingly supermanish and improbable. 5) All this has taken place in less than a year? It's getting like a Lee Child novel. How come everyone's not in the psych ward? (actually scratch that, that's probably going to be the slow boiling arc for next season) 6) The whole damn thing is just a little too played, no? For me Breaking Bad, once one of the best shows on TV, has gone the route of dare I say it, Lost, or worse Battlestar Galactica Season 4. No, I take that back, nothing could be as bad as BSG S4, but they want to watch themselves and in the words of Robyn, they want to, you know, pick it up!